MazeMonkeys was a game I started with a couple of friends back in 2008. It was a simple FPS. You’re a robot, rolling around, shooting other robots. When destroyed, you fall to your components, which can fly all over the place as you explode. It’s a simple but awesome looking effect. Levels had simple puzzles that you had to solve in order to progress. 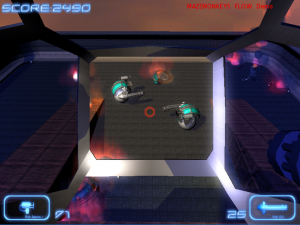 I’ll confess though, shooting at and blowing other robots up was just so much fun that’s mostly what we did in game. If you had FlowED (a 3D, Unity-like editor we wrote to extend Ogre) installed, the game allowed you to edit/mod it in realtime using FlowED. It was written in BlitzMax and C++ with Ogre3D as it’s rendering engine. The game never quite made it to completion as life took over and we moved on, but it’s a project I’m fond of to this day! These guys were having a dance until one got grumpy and blew the other up with a grenade. Whatever happened to Red Forest? Red Forest update – Greenlight, Re-re-re-relocation, new team!